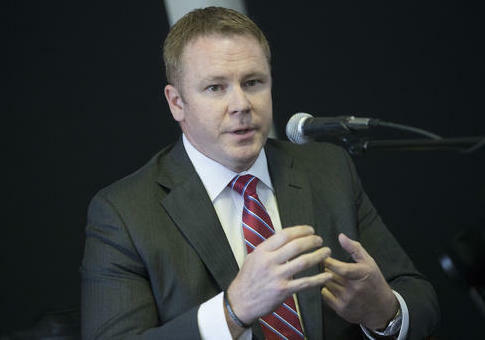 Former Army Ranger Warren Davidson, a Republican, declared victory Tuesday in Ohio’s special election to fill the congressional seat left open by retired House Speaker John Boehner. Davidson, who ran as a tea party candidate, notched 76.8 percent of the vote with all precincts reporting from Ohio’s 8th Congressional District, Dayton Daily News reported. His Democratic competitor Corey Foister received just 21 percent. Davidson could be sworn into the House Republican Conference as early as Thursday. Boehner’s successor, House Speaker Paul Ryan (R., Wis.), hailed Davidson’s win as a victory for conservatives. "We know Warren is a strong conservative leader—but he is also a small business owner. He understands first-hand the impact of an overbearing federal government," Ryan said in a statement. "He will serve Ohio’s 8th Congressional District well, just as he served his country with honor and distinction in the U.S Army." Davidson won a competitive 15-way Republican primary in March, soundly defeating moderate candidates, including two state lawmakers. He runs a manufacturing business in Miami County, Ohio, and was unknown politically up until six months ago. This positioned him as the outsider candidate voters have been drawn to this election season. House Freedom Caucus Chair Rep. Jim Jordan (R., Ohio) endorsed Davidson in January. Jordan was among those who led the push to oust Boehner from the speakership last year. Davidson will serve out the remainder of Boehner’s unexpired term through January 2017. He has to win a general election in November to serve a full, two-year term. This entry was posted in Politics and tagged John Boehner, Veterans. Bookmark the permalink.